Seafood lovers may need a bigger barbie soon, after James Cook University and partner organisations launched a new prawn research hub south of Cardwell. Black tiger prawn – (Pic: Agnes Le Port). The Australian Research Council Industrial Transformation Research Hub (ARC ITRH) for Advanced Prawn Breeding has received $4.9 million from the Federal Government to undertake research leading to a significant boost in the productivity of the Australian prawn industry. 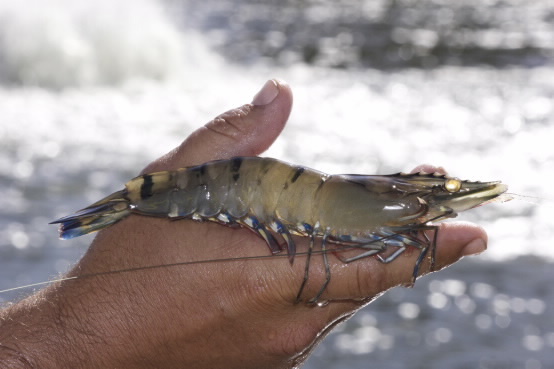 JCU’s Head of Aquaculture and Fisheries and Director of the new Hub, Professor Dean Jerry, said the project will focus on developing the world’s most advanced breeding program for the farmed black tiger prawn. “The end result being prawns that grow faster, are more disease-tolerant and that will retain outstanding eating qualities. Ultimately the program will mean increased productivity and international competitiveness for the Australian industry,” he said. The hub will be officially launched at Seafarms Queensland. It will work in conjunction with industry partner, Seafarms, Australia’s largest prawn farming operation, which runs 52 ponds at the site, just south of Cardwell. The Hub is hosted by JCU and involves industry and research partners the CSIRO, University of Sydney, AGRF and Universiteit Gent.